The heavy weight of your garage door is held up by strong metal springs, how many exactly will depend on a variety of factors. Every time your door opens these components are wound tight or stretched (depending on their type), and then unwind or contract in order to open it back up. Although they’re built from extremely durable materials they don’t last forever, due to the fact that they go through a lot of wear and tear on a daily basis. Both extension and torsion garage door springs will wear out and fail eventually, and you need to be ready for when that happens. Our technicians can ensure you avoid early breakdowns and accidents by providing you with a regular maintenance service. But if you end up having to deal with a broken spring, or want to get these components replaced in a timely fashion, we can also help. There are two factors that determine the lifespan of these components. Firstly, not all springs are created equal; obviously, cheap units will wear out much faster than high-quality ones, but the type also plays a factor. Extension type units will break down earlier than torsion springs will, due to the fact that they are not as durable and flexible, and work in a different, more stress heavy, way. Secondly, regular maintenance will significantly extends the service life of these units. Proper lubrication with silicon spray or white lithium grease and regular adjustment (which are part of the spring maintenance service our technicians provide) will see them stay operational for a lot longer. Extension springs will usually last for about three to five years, depending on their quality and how often the door is used. Torsion units can last anywhere from five to ten years, and it’s hard to predict when they’ll need to be replaced. Instead, it’s essential to recognize the warning signs that precede a break down – if your door is wobbling when it moves, or is struggling to support its own weight, then spring replacement may be due. 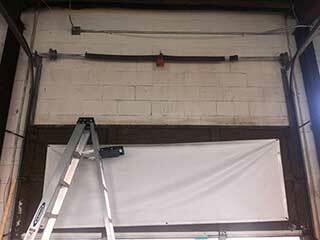 A typical garage door weighs between two hundred and four hundred pounds. The strength required to hold this weight is massive, which means the springs are under immense tension. Don’t try to tamper with them yourself, as this tension can be very dangerous if not properly released, and you could get seriously hurt. Instead, give our experts at Garage Door Repair Shelton a call. If emergency spring replacement is what you need or to schedule a routine maintenance inspection, we're the team for you.